Cats can have a wide range of skin conditions and problems. It can hard to diagnose, but there are a few tips to help answer your questions. The red spots indicate a parasite, such as fleas. Even if you bombed your house, she may still have some fleas. Have you had her treated for the fleas specifically? You may even have to take her to the vet and have her dipped in flea treatment to be certain you have rid her of them. They are pesky little creatures that like to hide. They create intense discomfort and her biting behavior indicates she is trying to rid herself of these creatures. If you have had her treated, then it may take a while for the irritation to go away. I'd give it a few weeks after treatment and if she is still exhibiting the behavior, visit the veterinarian again. Let us know how she's doing. Hope she feels better soon! I recently looked after someone's dog for a few days. While the dog was in my care, it never stopped scratching. I mean vigorous scratching! I looked at his skin and couldn't see any fleas, but he did have very red, sore looking skin. I told the people about the problem when they came back. Since then, my cat, Pilchard, has started scratching mainly around his head area. I've used Frontline flea treatment, but I'm sure it's not fleas. Now, I have started itching. Any ideas what this could be? Yikes! I'm so sorry to hear of this trouble, especially since you were trying to do a good deed. It sounds like the dog may have had anything from fleas to hookworm. Some of the symptoms you are describing are caused by hookworm, but it may or may not be that, and the only way to be certain is by paying a visit to your doctor and a trip to the vet for your cat. If the fleas were so bad that they would affect you, I think you would see them, particularly if you wear white socks as you cross your carpet because they seem to be attracted to white. That is why I suspect the problem is probably fungal or parasitic in nature. Please check back and let me know what the doctor and vet have to say and that you're healing. Also, when you find out what it is, be sure and let the dog owner know so they can treat their pet as well. My cat is always itching, but does not have fleas. She is an indoor cat. Her eating habits haven't changed at all and I haven't changed anything. I'm wondering if she has dry skin or should be seen by her vet. I would keep an eye on her a little longer before taking her to the vet. There are many things that can cause this and one is allergies. Cats have allergies just like humans do. If you have changed carpet or bedding, it could have caused a reaction in her. She also could have a single flea that was missed when you groomed her and that you are not aware of. Pets can pick up a flea very easily. I would start by retreating her for fleas. There are some great products on the market for this, including some [Homemade_Herbal_Flea_Collar|natural remedies]. On the other hand, if you notice that her skin is flaky or her coat lacks shine, she could have a dry skin condition. This can be caused by many things, but the most common is diet. You could try giving her a higher quality pet food that is high in Omega 3. If you choose to switch her cat food, remember to do slowly in stages of 25 percent at a time. So, you would start with 25 percent new food to 75 percent old food. After a few days to a week, you would go to 50 percent and 50 percent and so on. I would also brush her daily and you can even create a mist for her coat with Avon's Skin-So-Soft. There are details on how to do this in the article on dry skin cats. If all this fails or you do notice a change in habits, I would go ahead and take her to your vet as he might have additional suggestions. Good luck! I'm sorry to hear that your cat is digging at her neck. Have you ruled out fleas? 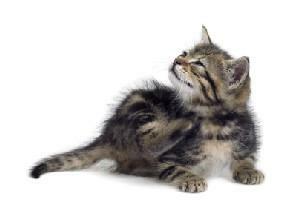 Even a single flea can cause some cats to scratch until they create sores and hair loss. Once you've ruled out fleas or ticks, then there are several other things you can try. While the oatmeal bath is good for an animal's skin, most cats hate baths and bathing cats too often can actually create dry skin. Cats are usually pretty efficient at grooming themselves. I'd like to see you try the supplements and high quality pet food first. There are many different foods on the market. You can read more in our article on organic cat foods. Also, try adding the omega-3 fatty acid supplement to a food with a very strong taste, such as tuna or liver. This will disguise the taste of the fatty acid, if the cat does not like the smell. Also, don't leave food out for most of the day and then attempt to feed this mixture. The cat is more likely to eat what you give her if she is hungry. Some of the symptoms you're describing can be a sign of various skin conditions, so I do recommend that you take her to the vet and have her examined. It is better to rule out anything serious, and the vet may have some additional suggestions about how to treat her problem.